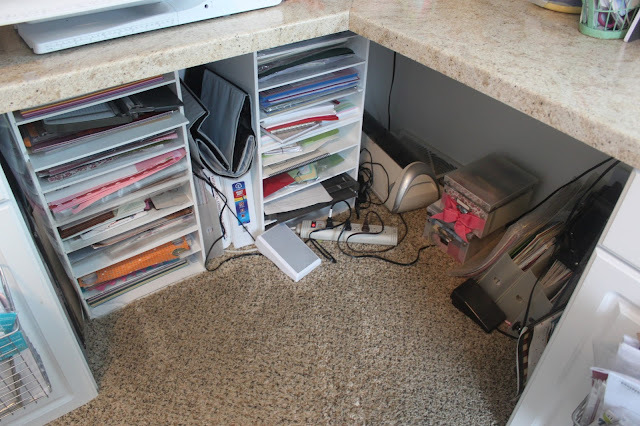 It seems like I am continually looking for "a better way" a "neater way" to have all of my gizmos and still be "neat". 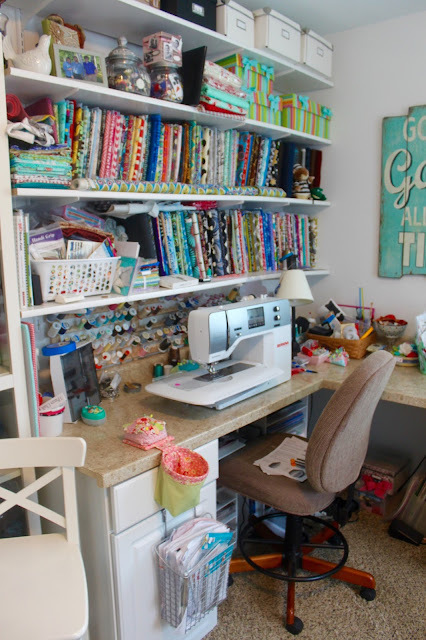 Crafting in any form is sometimes "messy" so the key is to have places to stash your stuff.... 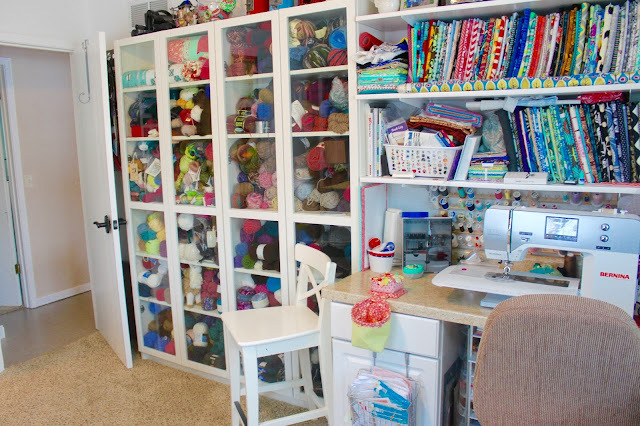 In that being said I have too much "stuff" so I just did a major revamp of my studio and replaced my "cube island" and my "scrapbook cube storage" with 2 Hemne 8 Drawer Dressers from Ikea.. I love Ikea how about you? 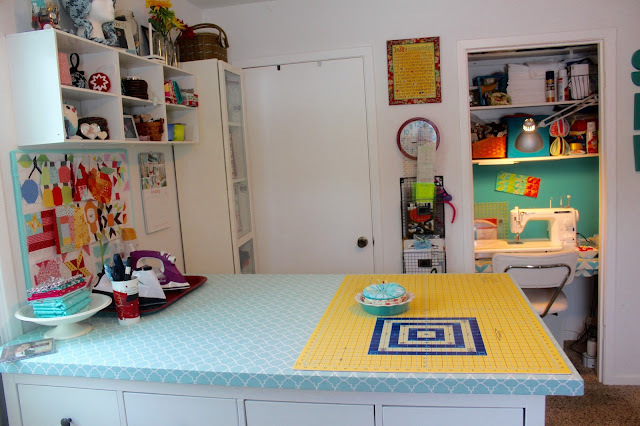 In case you are wondering the glass cabinets are also from IKEA they are the Billy System... Love them! 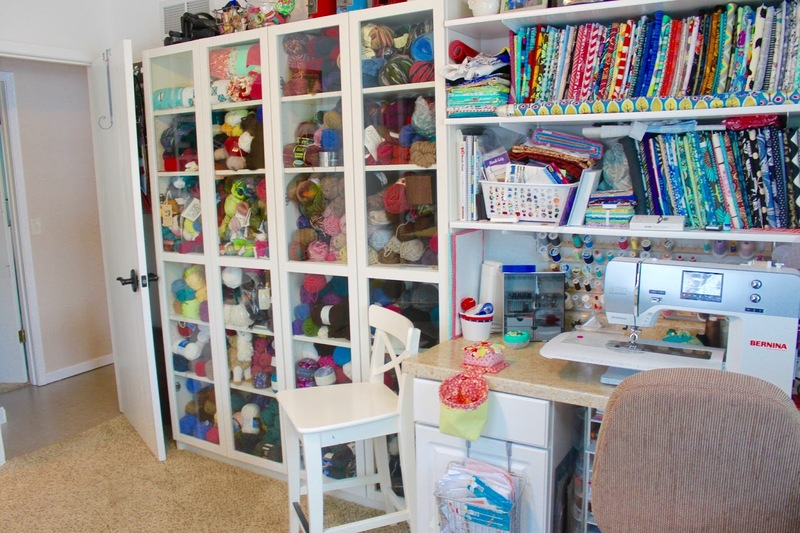 I have also been asked the size of this room, it is 12X14 and that does not include the closets. For those who have asked the dressers with the board on top is 38 inches tall. Oh and all of the bright light coming through the windows is the reflection of snow! Where was it last week??? I went to Lowes and had them cut a board (it was Birchwood in 3/4 in thick) the correct size to fit onto the top of both of the dressers (my hubby put a 3/4 inch strip around the outside so it would not shift) and then covered it with batting. 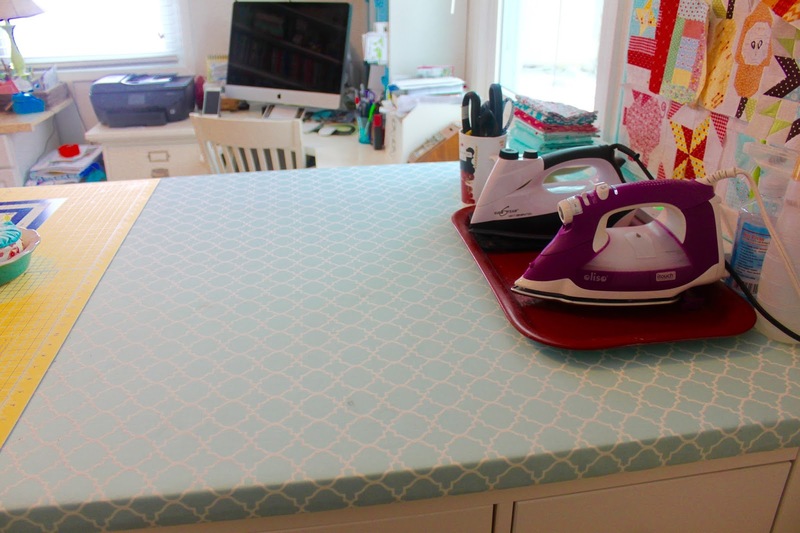 The whole thing can be used for an ironing board when I remove my cutting board. 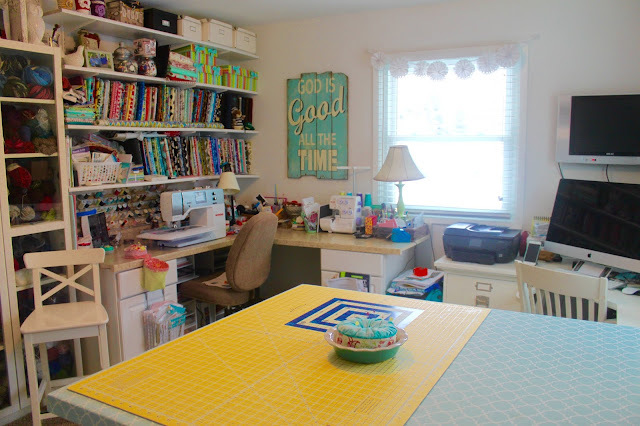 I also always get asked about the sign above my sewing area "God Is Good all the Time" it came from Hobby Lobby a year ago. 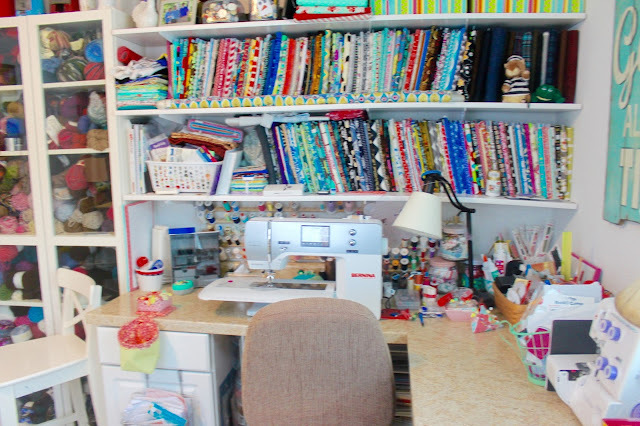 In the above picture you can see my sewing closet with my Juki TL2010q, now that machine will sew through about anything! I love it! Just to keep this post real this is under my sewing area.... It will soon disappear too! It is loads of scrapbook paper! 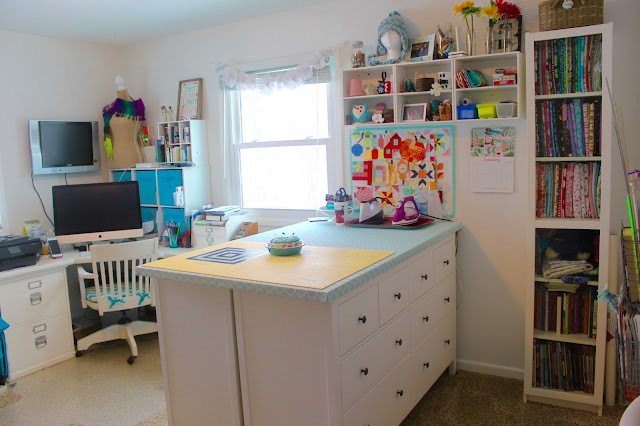 Those dressers are perfect! Ikea is on my wish list. I have never been to one before and I am dying to!! Thanks Amy! When you go to Ikea, plan to spend some time there... it takes a while for it to all soak in!!! ;) Happy New Year! Love your sewing space Nancy. No Ikeas in NM and the closest is a toss up between Phoenix and Denver, both too far to drive to from here, besides we have only a small car. I looked online and the shipping is crazy expensive to buy online from Ikea. Thanks Daryl and you are right it is really expensive to have it shipped. Sometimes as much as the product which is crazy!